Dedicated calibration sites provide the foundation of the 20-yr calibration program underpinning the success of the combined TOPEX/POSEIDON (T/P) and Jason missions. Located along the 10-day repeat ground track shared by these missions, these sites are carefully instrumented to provide an independent (in-situ) determination of sea-surface height (SSH) relative to the geocenter. The absolute (geocentric) in-situ observations provide the basis for calibrating the altimetric SSH measurements made by the satellite as it overflies each location every 10 days. 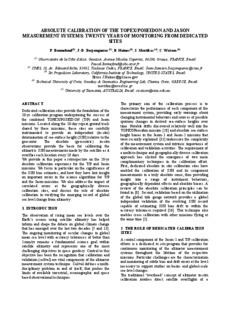 We provide in this paper a retrospective on the 20-yr absolute calibration experience for the T/P and Jason missions. We focus in particular on the significance of the SSH bias estimates, and how they have lent insight on important errors in the science algorithms for T/P and the Jason missions. We also address the impact of correlated errors at the geographically diverse calibration sites, and discuss the role of absolute calibration in verifying the emerging record of global sea level change from altimetry.